In follow-up to an earlier post (My Position Among (HGDP) Asian Populations By Principal Component Analysis Using 1000 SNP's), I've added links which provide some detail as to the peoples who are my genomic neighbors on the PCA analysis graphs for the continent of Asia: Burusho, Sindhi, Brahui, Makrani, Balochi and Pathan. These peoples are Pakistani-Iranian tribes of ancient the Dravidian, Persian and Indus Valley Civilizations. The Pathans, also known as the Pashtuns, are thought to be one of the "Lost Tribes" of Israel. The ancient homeland of the ancient Dravidians is postulated to be the same ancient homeland of many Indo-European peoples, called Urheimat. Urheimat is strikingly similar to the biblical city of Ur, I think. Urheimat is a German compound of Ur- "primitive, original" and Heimat "home, homeland". In follow up to my previous entry, taking another look at the phylotree, I suppose I could conceivably fit into a U5b2 grouping or into U5b1d, U5b1g or f or a few other subclades of U5b if I have coding region transitions to support one of these other groupings. But given my known Berber matches and the finding that another person with my same HVR-1 and HVR-2 transitions at Family Tree DNA is a U5b1b (with suggestion of U5b1b1), I doubt that I will fall into one of these other groups. Oh, I wish my results were going to be here sooner. Bummer, bummer, bummer. The expected date for receiving my full sequence mtDNA results has been pushed forward from 7/4 to 7/16! How can I stand waiting until mid-July?!!! I understand that they are doing science and have to be certain, but the waiting is so hard. I want to know! Am I a confirmed U5b1b, or even more defined into U5b1b1. 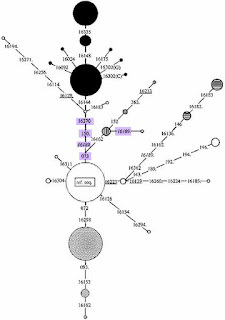 Looking at the U5b phylotree, I could be further defined into a U5b1b1 easily I think. None of my known markers excludes this and the defining markers for further definition only show up in the full sequence test which decodes the coding region (as well as the hypervariable regions which went as far as U5b for me). I'm anxious to find out what my coding region transitions are and fleshing out my U5b subclade some more.. So I sent off my kit fully expecting to be told my ancestors were from either the middle east or the balkans. As a Greek Jew what else would I expect? Well suprise suprise, I discovered I belong to haplogroup u5, which is concentrated in northeast europe, especially in Finland. I never expected my ancestors to be Scandinavian. It came as quite a shock really. I was born in Greece. So were my parents and their parents and so on. The connection between Frey and Kingship is clearest in Sweden [my top autosomal genetic match for deep ancestral origins] where Frey was the ancestor of the royal Yngling dynasty ... The Yngling royal house that descended from Frey took its name from the god, who is frequently called Yngvi-Frey, Ingunar Frey, and the like in Norse literature. 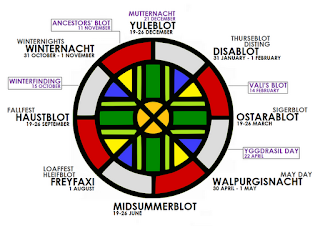 Consequently, as one myself descended from the very ancient Northwestern European Saami-connected U5b ancestral motherline haplogroup, it is very likely than my own Divine Ancestor (like Frau Holle), indeed, is Frey. 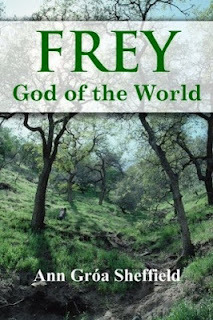 To summarize, Frey, and Kings whose stories suggest that they are identified with or assimilated to the god, are associated with reigns noted for their prosperity and peace. Frey is the divine ancestor whose blessings are brought forth again and again by his worthy successors; he is the benevolent god. Well, maybe Prince Moses was not the only Prince among the people of the Exodus after all. I like it that my ancestor's royal house is overwhelmingly associated with peace and prosperity for the people. If you like Frigga, and you like spinning and cord/knot magick, please visit and "Like" my newest creative endeavor, SeidrSpins, on FB. The grand opening event of the SeidrSpins Etsy shoppe is targeted for Samhain 2012, but I will be adding items over the summer in preparation. Find SeidrSpins on Etsy. My hand, it holds new life. The Goddess is by my side, and Her blessing is mine. 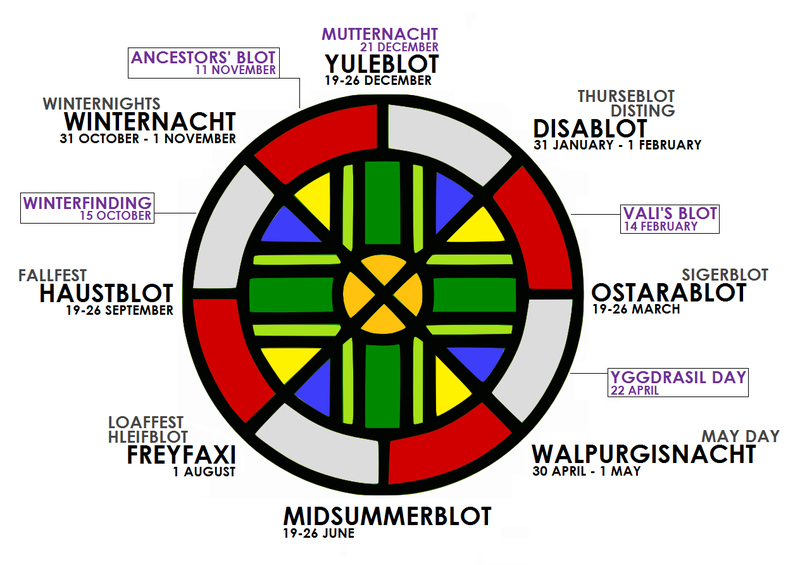 In follow-up to my previous entry, reading further along in a linked article in which the Dark Elves (Dökkálfar) are discussed, I find it interesting that Frey is the Lord of Alfheim (World of the Elves) and Hela (Frau Holle, my Patroness) are both significantly connected to the World of the Elves. The synchronicity of my experience earlier today came on the heels of listing my newest candle yesterday dedicated to Frey. Hi Frey (waves to Frey). Well, late this afternoon I felt extremely tired, so I laid down to take a nap. 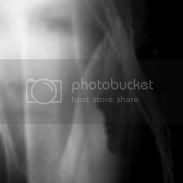 To make an interesting experience a short story, I met some mischievous Elvin family members made of the same whitish-yet dark color of the the twilight shadows (like deathly-colored even) in which my haim (astral self) believed itself to be awake even as I slept upon my bed. They played with my head at the head of the bed, messed with my astral computer mouse (until I told the one "I am going to get you! ", then he released it into my grip), shapeshifted alot, and I even had to remove one (stuck like glue) from riding my haim piggy back. During this close encounter, we came to an understanding about the rules of staying in my space. Interestingly, at first I was going to throw them out (as they gleefully amused themselves trying to frighten me with frightfully shapeshifting forms), but my nonplussed attitude softened when I caught in the shadows one's true form in between a "shifting" - it had the small hand of an innocent child. At that point, my heart stirred for them as more to me than mere nuisances, and instead I established some rules for living with me. After all, I told them, I am a wight too and made of the same stuff that they are, so they are just going to have to learn to get along with me, and we are going to have to learn to get along together. So, today I met some of my Elvin family members, the Dökkálfar (Dark Elves). This article (Massive Gold Trove Sparks Archeological Dispute) about a baffling ancient gold treasure found in Germany contains another interesting piece of information linking ancient Egypt with ancient Sweden more than 3000 years before the present. So, more evidence for Scandinavian U5b coming into African Egypt and comprising at least a portion of the ancient motherline mtDNA coming out of Egypt during the Exodus comes to light. There must have been a known trade route between ancient Sweden and ancient Egypt during that period of time, particularly among the merchant or trade class, from which Prince Moses was not. Being of the royal class, listening to underlings may not have been one of Moses' strong points, so everyone who stuck with Moses got lost for 40 years in the desert, while perhaps Korach's icy-land dissidents (who putatively got "swallowed up" by the earth) actually merely went another route (with Ruach HaKodesh, no less): to icy-land Sweden with the merchants, who already had established helpful contacts there. Perhaps Korach and his clan were, like me, U5b's (with a deeply profound love of "the cold" in our souls). My ancestor, Korach - an interesting and very plausible idea. How's that for more audacious conjecture? Some things may indeed be worth "dividing" over. This video from the music artist Ulla Pirttijärvi is the second track of the CD album "Mattarakhu Askai: In Our Foremothers". Pirttijarvi, once a member of the trio Angelin Tytot, has slowly unrolled a solo career (this album, "Mattarakhu Askai: In Our Foremothers" her second solo disc, comes five years after her first), but taking her time has proven to be a good thing. Ulla Pirttijärvi is regarded as one of the finest artists from Sápmi (Samiland). The joik is the vocal form of the Sami people, native to the far northern Scandinavia. It's often relatively free-form, with few rules, a song to describe a thing, place, person almost anything. Ulla Pirttijärvis joik (recorded in her own home) is emotive and haunting. In follow-up to my previous post, this post will look at the prophetess Hulda (in Jewish tradition) and her hidden connection to the Death Goddess Hulda (of Norse tradition). In Old Norse, Hulda means secrecy and hiding. Let's see what's secretly hiding in Hulda's Hebrew name. The Hebrew name Hulda (חוּלְדָה‎) from the Hebrew root חלד means weasel. The weasel is a classic totem used by shamans as a guide through the Underworld, the realm of the dead. Clearly then, right from the start, we see the connection of the Hebrew prophetess Hulda, through her Hebrew name, to the Underworld and to the Death Goddess, Hulda. A Death Goddess of focused compassion, written חולדה (as opposed to mercy, written אל-חלדה), Hulda in Swedish, my top ancestral genetic match, means lovely, delightful, faithful, loyal and gracious (chen). My patroness, Frau Holle, the ancient earth mother goddess of Old Fate, snow, spinning and illumination is also know by the names Holda, Hulda, Hel and Hela. As Hel and Hela, Frau Holle is an Underworld and Death goddess. She is also one of the Jotnir, the deities of the Jotunfolk (Giants). I am of her bloodline and she has claimed me. Afflicted with scoliosis (I wore a back brace for 4 years as a teenager to straighten my back), general skeletal deformities are a characteristic of those of the Jotun bloodline from the Iron Wood clan. My personal history with anger, extreme introversion, cold detachment of personality, and the tendency to "hibernate" in my own space also suggest that Frost-thurse and Mountain-giant clan-bloods also mix in mine. All of these are giants of the Rökkr. Rökkr means twilight, a liminality which partakes of both Night and Day. It also refers to the Hagazussa (hedge-sitter), a title worn by Hela, my patroness. Hagazussa is the root of the German word hexe (witch). Rökkr means shadow, the soul, the visible testimony of what exists within. Helheim, the Land of Shadows, is Hel's country in Niflheim. Nifl is another form of Rökkr. The children of Nifl (the children of Hela - the Nifl-Hela) are known in Semitic legend as the Nephilim, the children of the pre-Mosaic goddess Nephesch, the dark counterpart of the light goddess Shechinah. Darkness is the core foundation of light. Without darkness, there is no light. Light is itself a mask worn upon the face of darkness for a time, until it's life energy is spent. As darkness is the foundation of light, we can see then, how it is that the Death Goddess is also a Goddess of Illumination. As Hulda, the Death Goddess is known for her transpersonal compassion, but it is a compassion that does not lie, no matter how hard the truth may be to take. There is no softening comfort sitting at Hulda's table - spiritual evolution, not mercy, is Hulda's focus. Yet Hulda's compassion is quietly full, noninvasive and protective - she provides a safe place for healing and full acceptance, warts and all. The monster within, the untouchable, the rot - don't try to pretty these things up with Hulda - these things are holy to her. The hard healing truth which leads to spiritual evolution - this is what you get from the Death Goddess Hulda, and this is also why Hulda is the prophetess sought out by Kings in Semitic legend. Life is wasteful, but Death wastes nothing. This war not only destroyed much of Sapmi but it also destroyed much of their heritage. The Germans scorched land tactics burned most of the remnants left by the ancestors of the Sami hundreds of years ago which had been still standing after all that time. Had things turned out differently the Sami people might not even be here today. If the Germans had won the war, they had planned to start systematically “exterminating” the Sami because they considered them less than human and compared them to the Jewish people whom they hated so much. If connections illustrated by mtDNA haplogroups found in 90% of Saami aren’t showing up in PCA analysis of total genome content, then something is wrong with either the PCA analysis method, or the Southern European total genome sample. My suspicion is that the Southern European total genome sample, which has far fewer individuals than the Southern European mtDNA datasets is failing to pick up traits that while predominant in the Saami that a very rare in other places where these haplogroups are found today, either due to founder effects in the Saami population (perhaps the entire pre-modern population had roots in people on a handful of coastal canoes who were genetically atypical), or due to subsequent dilution of the European and North African populations by overwhelming levels immigration from elsewhere (for example, upon the arrival of Neolithic farmers), or both. In other words, I think that it is likely the the much smaller sample sizes used in whole genome studies simply miss the entirely the low frequency contributions to the mix, because the smaller sample size lacks people who have these low frequency genes. PCA analysis, because it is focused on the average similarity of whole genome comparisons, rather than having the ability to focus on phylogenetically notable outlier components, likewise obscure the contribution of low frequency genetic elements, as does a tool like Admixture until you have a very large number of source populations in the mix. The Saami affinity to Berbers and Southern Europeans is not really to these populations as a whole, but to an ancestral population that has left a less than 2% trace in the modern Berber and Southern European populations, but has left a 90% impact on modern Saami populations in the matriline (and hence, presumably, has had a total genome impact in the Saami of 45% give or take, or much more, if there was also a major Y-DNA contribution). It would really make more sense to see how much of a Saami contribution there is in Berber and Southern European whole genomes, since the relative uniformity of Saami genetics and the Saami cultural context suggests that it may be a relatively pure ancestral type that is no longer found in other populations, than to try to look at the amount of contributions to the Saami total genome that come from other source populations. If the analysis proceeded that way, one would expect to see a small component (under 2%) of whatever color was assigned to the Saami, in a wide variety of European and Berber populations. Sámi artist Berit Margrethe Oskal singing/yoiking "Eamifámut" (English: "Ancient Forces"). My earlier POPRES European post was plotted using the wrong Principal Components for this particular analysis. In the earlier post I used PC1 and PC2. I was supposed to use PC1 and PC4. So, here is my corrected graph. In this corrected analysis, my closest European genomic neighbors are Sweden (SE) and Norway (NO). Finland (FI) falls a bit above me (csv) on the graph. The countries clustering near Finland are Germany (DE), Norway (NO), Poland (PL) and Latvia (LV). In the mass nearest to me on the right in the graph are the United Kingdom (UK), the Netherlands (NL), Sweden (SE), Poland (PL) and Ireland (IE). This high resolution graph (using 74,000 SNPs) was generated by uploading my autosomal SNP csv raw data file to Stanford's Interpretome site and using their tool to do all the hard work. ADJÁGAS music is gentle, peaceful, dreamlike, spiritual and utterly engrossing. It is, at the same time, strangely alien. Lyrics are unrecognisable, startling vocals delivered in a style that veers between whispered but crystal clear sweetness, unbridalled emotion and all points in between, sometimes hitting notes that may previously have never existed. Their music is based around the concept of the yoik, a traditional musical form which describes something not with its words but its sounds. You can start a yoik where you like, you can end it where you like. Its elements remain structured, but its fluid at the same time. A yoik is like liquid in a bottle you can shake it up, but the contents remain the same. And the content of the yoik deliberately has many meanings, in order, if necessary, to spare the feelings of the subject. So it may pass judgement, but its open to interpretation. It is also possible to be the subject of more than one yoik: how it sounds depends upon the perspective of the person who is delivering it. More importantly, a yoik is not written. It comes to a person. It is not strangely alien to me, but comfortingly familiar. It may be a possibility that the Mesolithic reindeer-hunting Saami originally came from the reindeer-hunting Upper Paleolithic Magdalenian Culture of France. France is another genomic match of mine. This paper challenges the fading scientific hypothesis that the Saami came strictly from Asia originally and instead supports the current scientific thinking that the Saami are a "circumpolar" people who remained in area of Northwestern Europe around the time of the last Ice Age. This paper (Sami Prehistory Revisited by John Weinstock, University of Texas) states, "the maps (above) show the ice sheet at 10,000 BP and 9,300-9,200 BP (Eronen et al. 2001: 19). They illustrate how rapidly the ice was shrinking and the avenues by which humans could reach Fennoscandia." By ca. 13,000 BP long stretches of the Norwegian coast were ice-free but, as Hein Bjartmann Bjerck points out, there was “no certain evidence of human settlement in this rich arctic biotope” until near the end of the Younger Dryas (1,300 year cold snap) about 10,000 BP (2008: 65). The earliest evidence of human activity in Scandinavia is during the Early Mesolithic chronozone from 10,020-8,900 BP (9,500-8,000 cal BC); Bjerck lists 37 key sites in Norway (Ibid. 75-78). There were three coastal techno-complexes: the Fosna along the coast of southern Norway, the Hensbacka in southwest Sweden near Bohuslän and the Komsa in northern Norway, all with a forerunner in the late Paleolithic Ahrensburg culture further south (Ibid. 74). The Middle Mesolithic chronozone 8,900-7,690 BP and the Late Mesolithic chronozone 7,690-5,230 BP follow, the latter period witnessing an increase in rock art. This scientific paper states "both, C-T 16270 and T-C 16189 transitions (even though not in combination) are known in European populations" (except among the Saami of lineage 1). I have both of these genetic transitions, in combination. There are two major (lineage 1 and 2) and two minor (lineage 3 and 4) maternal lineage clusters found among the Saami from Northern Norway. This figure from the scientific paper Saami Mitochondrial DNA Reveals Deep Maternal Lineage Clusters demonstrates that my maternal line clearly is part of Saami lineage 1. 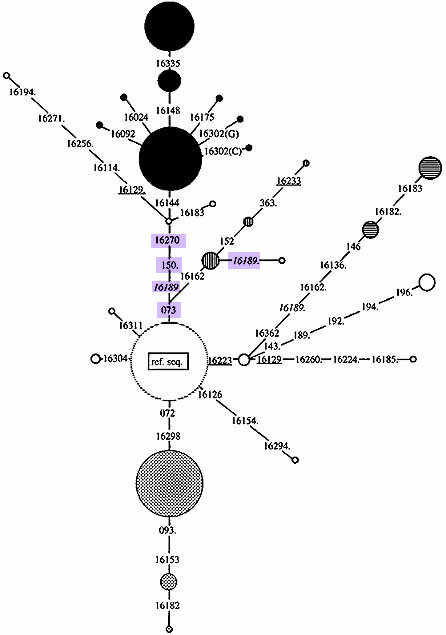 My own mutations are highlighted (purple shaded numbers). The mutation at 16144 distinguishes Saami haplogroup subclade U5b1b1a (with the mutation) from Saami haplogroup subclade U5b1b1 (without the mutation). Figure legend: "Skeleton network constructed from Saami mtDNA haplotypes using our own data and data from Lahermo et al. , Dupuy and Olaisen et al. and Richards et al. . The size of the circles is proportional to the frequency of a given haplotype. Black circles mark lineage 1, gray circles mark lineage 2, horizontally striped circles mark lineage 3 and vertically striped circles mark lineage 4. The sequence of branching substitutions could not always be established, in particular in rare lineages without known intermediate haplotypes and are marked with a dot. Positions with possible parallel substitutions, e.g. 16233, are underlined. The hypervariable position 16189 is in italics." This article states the mtDNA mutations at 16270 and 150 (I have both), a Saami motif, "has a 2% frequency among the Berber and Fulbe populations. It has a low distribution in Europe, except among the Saami [48%]." This further supports my prediction that my full sequence mtDNA subclade will turn out to be U5b1b (when I finally receive the results). Taken from their new album, check http://www.everrecords.com/adjagas for more info. "This song is in the northern Saami language, spoken by the arctic﻿ indigenous people inhabiting Sápmi, which today encompasses parts of far northern Sweden, Norway, Finland and the Kola Peninsula of Russia. The northern Saami language is only one of seven different Saami languages." This song is from her album "Beyond" (Sámi: "Dobbelis") - 2010. Since it looks like my motherline may ultimately originate with the Saami people, I'm following this line back into prehistory. The Saami, the oldest ethnic group in Northwestern Europe, is considered to be the indigenous population of the area. Additionally, the Saami are considered to be a cultural continuation of the Paleolithic and early Mesolithic Komsa culture which existed from around 10,000 BCE in Northern Norway. The Komsa culture is itself part of the "pure hunter-gatherer" Fosna-Hensbacka culture. The Hensbacka culture later evolved into the Sandarna culture which is found along the coast of western Sweden (a primary autsosomal STR match for me). The majority of Hensbacka sites (ca.75%) are located the islands in the outer archipelago (another mtDNA genetic match for me through Roots For Real). Sometimes the Sandarna culture appears as the name of an intermediary form between the Swedish Hensbacka and Lihult cultures. This name comes from a settlement near Gothenburg (approximately 7000 BC–5000 BC). The Lihult culture lived in Norway and Sweden. It looks like my motherline is indeed very anciently Nordic, as are many of my ancestors by autosomal genomic analysis. "Schematic reconstruction of possible entry routes of the predominant Saami maternal lineage to Fennoscandia. 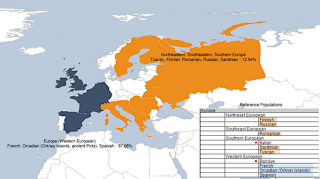 Broken lines indicate that the exact place of origin/route of spread of the haplogroup is unsolved/not indicated." Given my own genomic links to southern (Spain, Tuscany, Sardinia) and western (Scotland, Wales, UK, Ireland) Europe, above shows a possible migration route of my motherline through or near these areas. 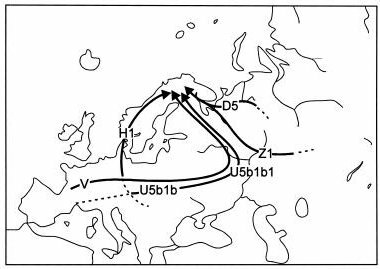 Here it is reported that a high number of people in the U5b1b subclade of U5 is found in Ashkenazi Jews living in central Europe. I matched Ashkenazi Jews living in Hungary and other areas of central Europe through Roots For Real and my Jewish family name (Grunwald) is recently associated with Budapest Hungary. In follow-up to my earlier post, using a chart at Family Tree DNA and comparing them again my own known HVR-1 and HVR-2 mtDNA genetic markers (namely 16093.C, 16189.C, 16270.T, 73.G, 150.T, 263.G, 315.1C), and still waiting for my Control Region markers as determined by Full Sequence (FS) mtDNA testing, I can easily predict that my U5 subclade is very likely going to be U5b1b(1), a subclade shared by the Saami of Northwestern Europe and the Berbers of North Africa (an mtDNA match for me through Roots For Real). I don't have the HVR-1 mutation at 16144 (exclusive to the Saami and not shared by the Berbers), so I'm rather doubtful that I my FS results will place me into the further derived (Saami-specific, Berber-excluding) U5b1b1a subclade of U5. My prediction is further supported by all the genomic links I have (both autosomal and mitochondrial DNA) to specific parts of Finland, Norway, Sweden, Russia and Asia as do the Saami, and given both the Saami and I tend to be outliers on many world population graphs, I think it's pretty clear that my Northwestern European motherline came through and from among the Saami. Studies of multiple DNA markers have confirmed the overall similarity of Sami with other European populations, but some genetic markers yield results that are consistent with a genetic contribution from Asian populations, distinguishing Sami from the peoples of Southern and Western Europe. Based on a chart at FTDNA, from my already known mtDNA genetic markers, I predict that my full sequence mtDNA haplogroup may be U5b1b. I expect the actual results around 7/4. My autosomal SNP's don't evidence any trace of Neanderthal admixture? How can this be? This pie chart resulted from swishing my SNP csv file through Stanford's Neanderthal Explore tool. All of my alleles scored zero (not shown). The first graph shows my position among Middle Eastern and Jewish populations using high resolution (SNP n=100,000) Principal Component Analysis, comparing PC4 and PC5. Not sure what the definitions of PC1-10 are yet, but once I know what these components actually consist of, maybe I can interpret the results more clearly. Nevertheless, I am in the thick of things in this graph (and even more so in the second graph which compares PC9 and PC10 by high resolution). Okay, so I may not be such an outlier in every component comparison. I need to find out the definitions of the principal components. Well, here I am again in the data hole among Middle Eastern and Jewish populations. By high resolution Principal Component Analysis using 100,000 autosomal SNP's and Stanford's Interpretome tool, just like in the European panels as an individual of Northwestern European ancestral descent, I am an outlier as an individual of ancestral Jewish descent in this Middle Eastern panel. My closet genomic neighbor on this graph are the Iranians. It is interesting that in the high resolution panels containing data from both of my primary ancestral ethnicities (Northwestern European and Jewish), I am an outlier. My genome is strange, I think. Yes, as I wrote in the earlier post, maybe I am mostly Neanderthal (just kidding, I think). At high resolution, using 100,000 autosomal SNP's, here I am again by region (and again, in more regional detail) in the data hole where very likely other Northwestern Europeans rest as well. In followup to earlier posts, this graph shows my genomic position among the reference populations in the database (which lacks a clear reference population for Northwestern Europeans, which is a significant population for accurately assessing my ancestral links). I'm really disappointed that Northwestern Europe is not clearly referenced. This lack of representation represents a big hole in the reference population data which is further highlighted by the many world graphs in which I am an outlier. My populations are very likely in this BIG HOLE in the data. Wow. I am a huge outlier on this graph. UPDATE - I was supposed to use PC1 vs. PC4 (instead of PC1 vs. PC2 as I did in this graph). Here is the corrected graph. In followup to earlier HGDP population posts (World, European general, European specific, Middle East & Jewish), this graph plots my genomic position among African (HGDP) populations using 1000 autosomal SNP's and Standford's Interpretome tool. As with the World populations graph, I am also an outlier on this graph as well, with none of the African populations graphed coming into close proximity to me. I did match the North African Berber tribe on my mtDNA motherline results, but that tribe is not listed on this graph as one of the primary African populations in the database. In followup to an earlier post, this graph provides more detail as to my genomic position among specific European HGDP populations. According to this plot, my most proximal genomic neighbors are Orcadian, French and Basque, with some Tuscan, North Italian, Russian and Sardinian. Like in the previous European graph, my genome falls in the hub of the entire cluster. This makes sense, given my mtDNA motherline haplogroup is U5 (specifically U5b), the oldest motherline in Europe. In follow-up to my previous two posts (which look at my genomic position among HGDP World and HGDP European populations), this graph plots my genomic position among Middle Eastern and Jewish populations using 1000 autosomal SNP's and Standford's Interpretome tool. Highlighting the individual data points on the original graph at the Standford site, my closest genomic neighbors on the graph are Yemenese (purple square to my left), Ashkenazi Jews (purple diamond below me), Egyptians (beige upright triangle to my right), Yemen Jews (green triangle southwest of me), Sephardic Jews (tan triangle northwest of me), Saudis, Syrians, Jordanians, Moroccans, Morocco Jews, Turks, Lebanese, and Samaritans. So, these populations are genetically close to me, as far as our autosomal SNP's are concerned. Interestingly, though Armenia, Hungary and Russia matched significantly on my mtDNA motherline HVR-1 and HVR-2 results from Roots for Real, neither Armenians, Hungarians nor Russians show up in close proximity to me here on these autosomal SNP results. Though I rest on the top right edge of the Middle Eastern and Jewish populations cluster, I clearly fall within the area of the primary cluster (unlike with my HGDP World population map, where I was a rather clear outlier even though I did fall close to the European, Near Eastern and one of two African clusters). It revealed that equal proportions of Scandinavian males and females settled in Orkney, which they found to have an overall Scandinavian ancestry of approximately 30%. So, along with my straight-up Viking ancestry which may have originated in Finland, Scandinavian ancestry significantly admixes into my Celtic ancestry through Orkney as well. According to the autosomal SNP genetic analysis I had done through Family Tree DNA, I am 87.06% (blue) Western European (my specific subpopulations - French, Orcadian-Scotland's Orkney Islands, Spanish) and 12.94% (orange) from other areas of Europe (my specific subpopulations - Tuscan, Finnish, Romanian, Russian, Sardinian). I have no appreciable genetic links to ancient Basque or Italian populations by autosomal SNP analysis (although I do have links to the Italian peninsula through ancient Tuscany). Sweden and Norway are not part of the reference populations (see map), so it may be that the SNP population data for these two areas are still under scientific development (autosomal SNP genetic analysis is still developing its population databases I think). Even as a developing method of ancestral analysis (in contrast to autosomal STR ancestral analysis), I suppose these autosomal SNP ancestral analysis results are in general agreement with the autosomal STR genetic results in that they also report that my genetic ancestry is largely Celtic (originating in Scotland's Orkney Islands with the ancient Picts) and then later Scandinavian (likely originating in Finland, which has a history intimately intertwined with Russia, Norway and Sweden). Ancient Pictish history is tied to both the Celtic and Scandinaivian peoples. Also importantly, the ancient Neolithic Picts themselves originally came from the Iberian Peninsula (which is Mediteranean and explains Spain). Before that, they came from North Africa. Sardinia and Tuscany are near and in the Italian Peninsula, but are distinct populations from Italy proper (see reference populations on map). In prehistorical times, Tuscany lost territory to the Celts, so it is likely some ancient Etruscan Tuscans simply got absorbed into the Celtic (Pictish-Celtic) gene pool. The first settlers of prehistoric Sardinia came from Etruria (present day Tuscany) and the Iberian peninsula (Spain), so the Sardinia result is also explained by these populations becoming admixed with the Pictish-Celtic gene pool. Both Sardinian and Tuscan genes found their way into the Pictish-Celtic gene pool via Spain. The oldest human traces in Europe are found in France - "The oldest traces of human life in what is now France date from approximately 1,800,000 years ago." Consequently, the French result likely reflects my most ancient genetic beginnings in Europe (even possibly through Neanderthals, since 1-4% of the genome of all Eurasians has been contributed to us by Neanderthals), and in consideration of the fact that my motherline mitochondrial genetic haplogroup is U5, the oldest motherline haplogroup in Europe, arising in Europe approximately 50,000 years ago when the first homo sapiens came to Europe. Like France, prehistoric Romania evidences some of the first homo sapiens to inhabit Europe. Also, ancient Celts lived in Northwestern Romania, so Romania also links up with ancient Celtic civilization, which likewise links back to the ancient Picts in Orkney (Scotland). Taking all this together, it reasonable to say that my primary ancestral heritage (by autosomal SNP genetic analysis) is Pictish-Scottish-Celtic (with associated links to Northeastern, Southern and Southeastern Europe as discussed above) and Scandinavian-Finnish (with associated links to Russia and other Scandinavian countries as discussed above). This is in general agreement with my autosomal STR genetic analysis results which also tell me I am mostly Celtic and Scandinavian, with ancient genetic admixtures from other areas of Europe figuring into my genetic stew. According to information at the Family Tree DNA website, these results reflect my ancestry for the last 100-2000 years (40-80 generations) and "may also reflect one population that mixed with another in ancient times and became fixed in the second population."